Typed on my one of Rheinmetall KsTs, this one with the serial number 273921 (1948). 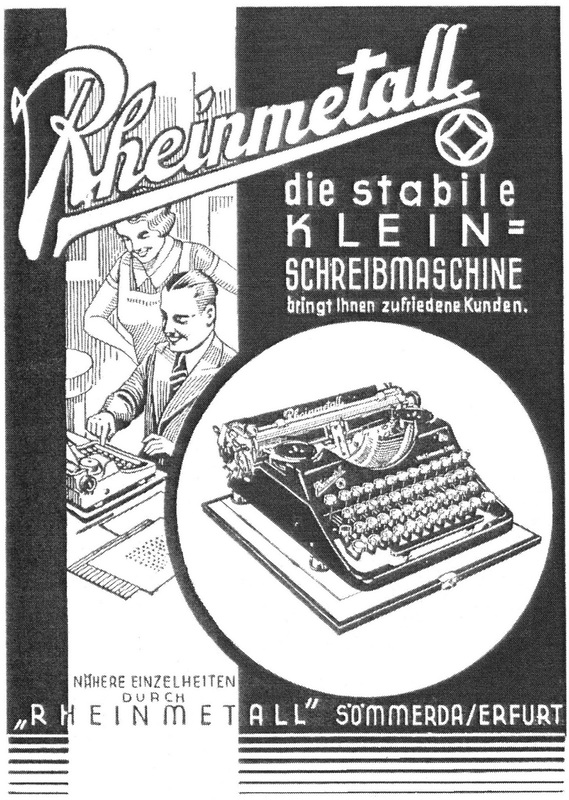 The abbreviation KsT stands for "Kleinschreibmaschine mit Tabulator"
- or small typewriter with tabulator. This is the second of my black Rheinmetall KsTs (serial number 274529). It is used as a demonstration model, to show how easily the carriage can be removed. This one came to me from the late West Australian collector Bruce Beard. The listing on Australia eBay earlier this year of a Commodore standard-size typewriter as "a 1930s vintage machine" underlined just how confused people in this country are about Commodores. 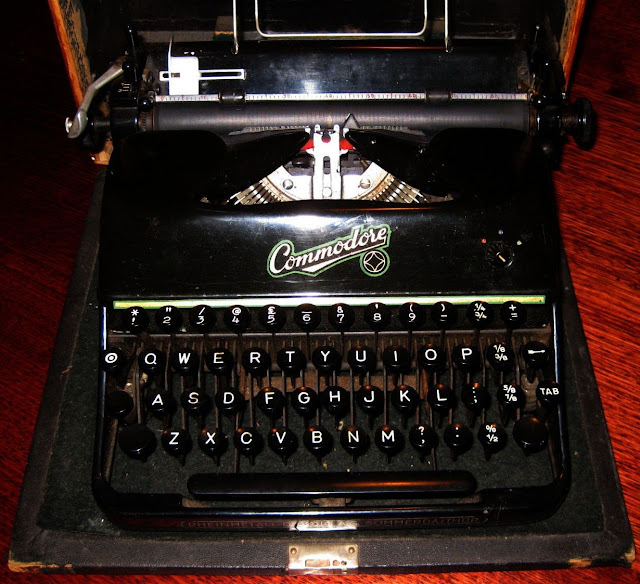 Last year a woman in Melbourne contacted me about a Commodore portable (below) she wanted to sell. I went to great lengths to explain to her the admittedly complicated history of the machine, and she listed it for what I thought was a reasonable price. However, a busy body got in touch with her, offered her less money for it, yet told her it was actually more valuable - it was a relabelled Royal, the clever Mr BB said. Bewildered by all this, the woman withdrew the item. Not taking my word for what it was, she then sought advice elsewhere. Naturally I washed my hands of the whole affair. 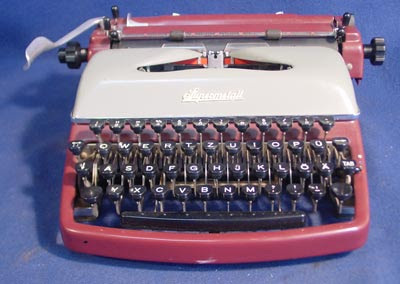 Jack Tramiel did not found the Commodore Portable Typewriters firm until after he had bought his office equipment repair shop in the Bronx in 1953. Commodore International Ltd was not established until Tramiel moved assembly operations to Toronto in 1955. 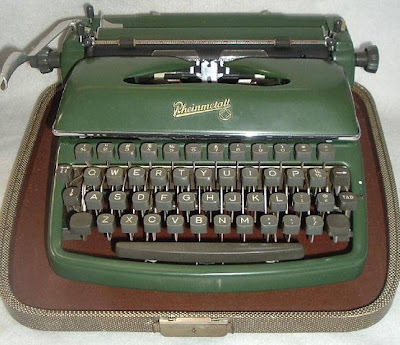 At that time Tramiel's $176,000 contractual arrangement with Sears was for typewriters assembled from parts manufactured by Zbrojovka Brno NP, maker of Consul typewriters, in Czechoslovakia. 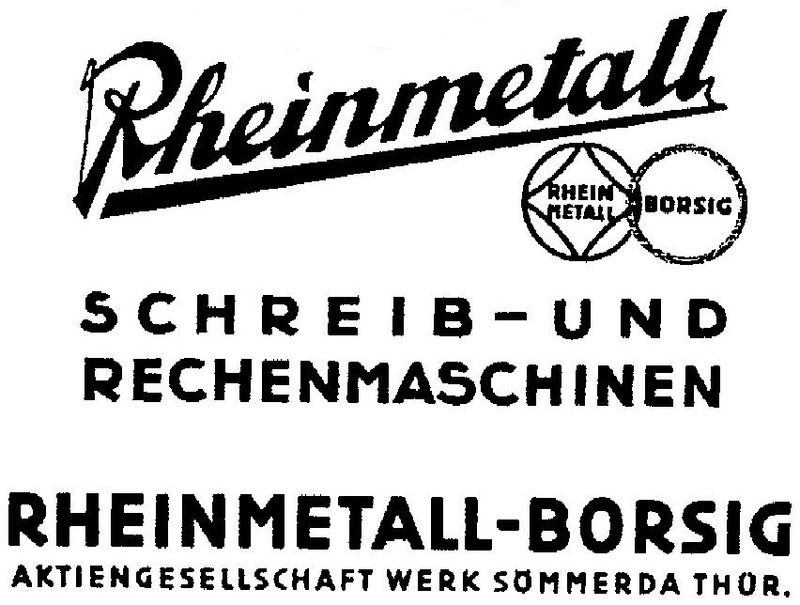 Tramiel did not start to deal with German company Rheinmetall-Borsig AG in Sömmerda, Thuringia, until Consul was able to surmount trade restrictions and start to sell machines in the West under its own name, in 1962. The timing of this suited Rheinmetall and Tramiel. From May 1958, Rheinmetall's Sömmerda factory had been gradually integrated into East Germany's state-owned and Erfurt-based VEB company, with the focus increasingly on data processing and office equipment. 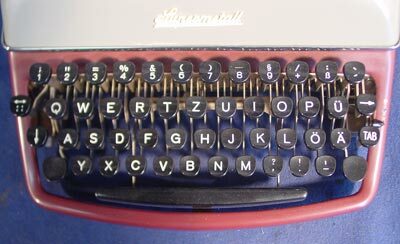 The next year, Rheinmetall began to scale back production of its KsT portable typewriter line, introducing the Supermetall, with a rounded front section and the removal of the ribbon colour selector switch from the front panel (it was replaced by a more conventional switch on the side of the keyboard). 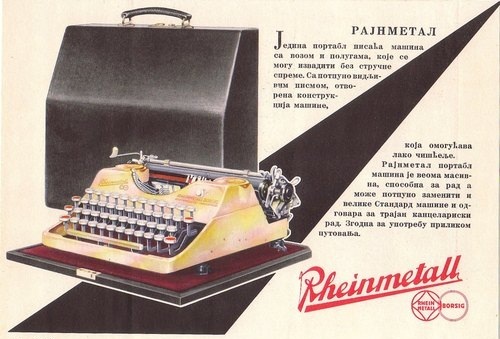 Significantly, KsT production ended in 1962, when Rheinmetall introduced its automatic electronic invoicing machine under the new trademark Soemtron. 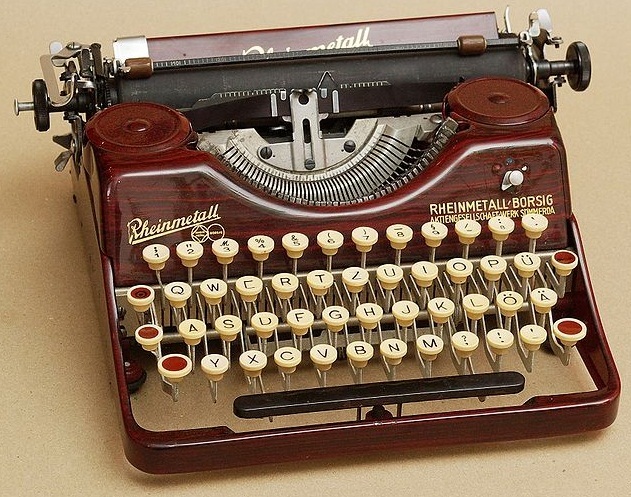 Clearly, during this process, already manufactured parts, and the tools and dies and machinery to produce parts for the KsT portable typewriter, became obsolete to Rheinmetall and available to Tramiel. 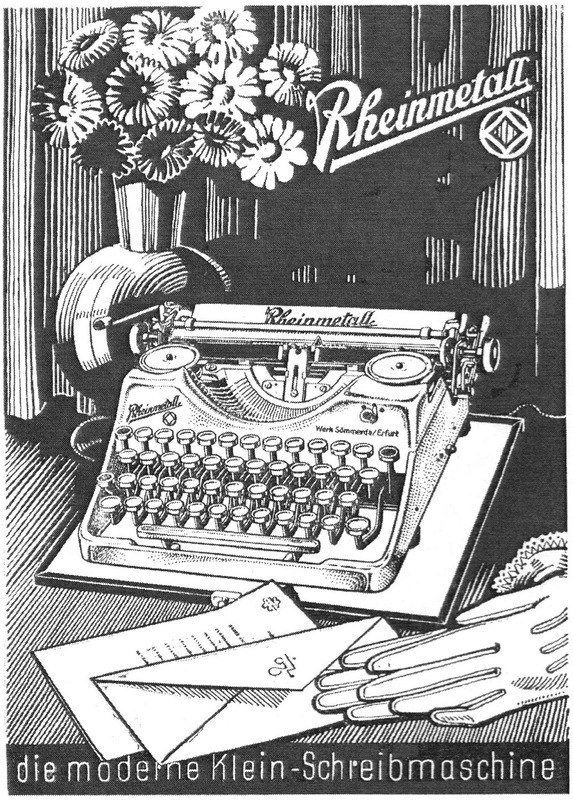 The year 1962 was also when Commodore became a public stock company (and what an investment it would have been at $2.50 a share back then) and allegedly began to "manufacture" typewriters in Toronto. 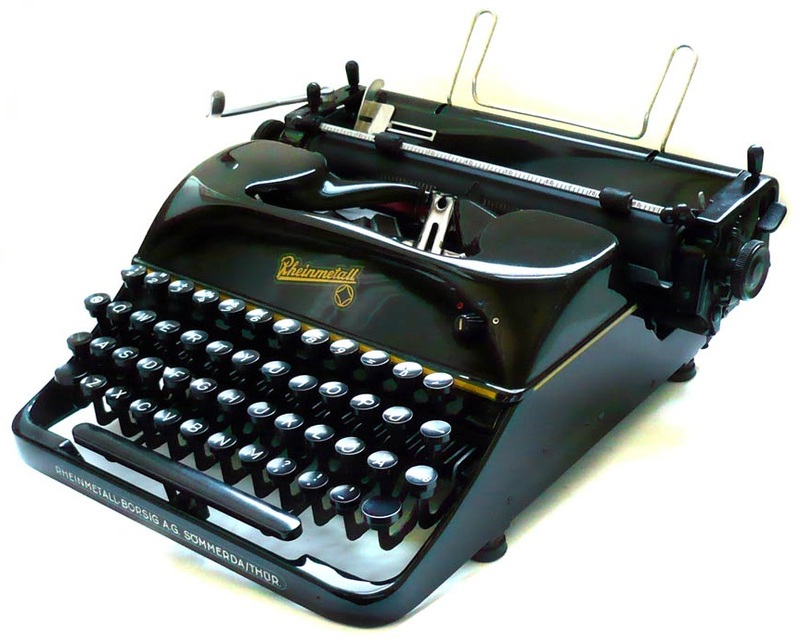 The truth is, Commodore never "manufactured" a single typewriter. 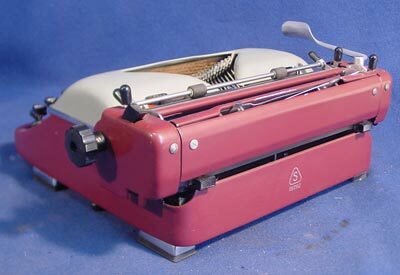 It merely continued to assemble them, but from 1962 using different parts to make a different machine. The idea remained the same: to beat tariff restrictions in Commonwealth countries. Tramiel liked to claim Canadian-assembled typewriters were "Canadian products". But strictly speaking they were not. 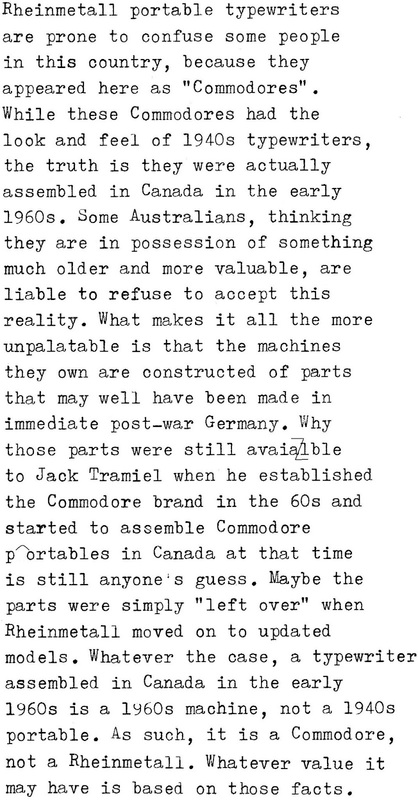 Commodore typewriters assembled in Toronto from Rheinmetall parts and marketed as Commodores date from 1962 - NOT BEFORE. 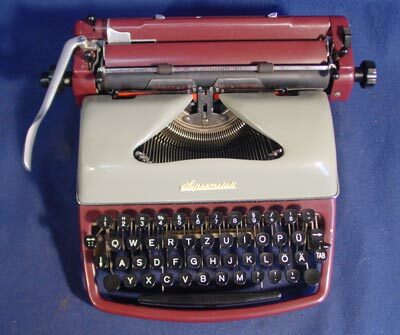 The question here is this: Does a Commodore portable typewriter assembled in Canada in the early 1960s from parts built in Germany much earlier than that constitute a 1940s or 50s typewriter on a 60s one? And is it really a Rheinmetall or what it says it is, a Commodore? My feeling is that it is a 1960s Commodore. But maybe I'm just being pedantic here. After all, I own three beautiful Rheinmetall portables, ranging from 65- to 54-years-old, and I have never kept a single Commodore. I've never owned a Commodore that matched up to a Rheinmetall - maybe a Consul, but never a Rheinmetall. Snobbish? Yes, OK, I'll concede that. 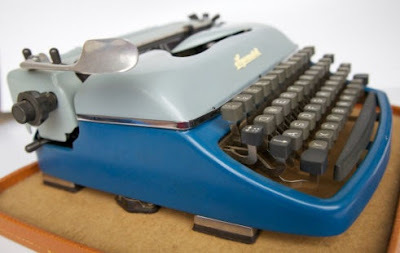 But what really concerns me here is people trying to pass off a 60s-assembled Commodore as a German-made typewriter from a significantly earlier period. I have posted on Tramiel many times on this blog, notably here and here. So I won't go into his life story again. What I will do is take a close look at Rheinmetall. 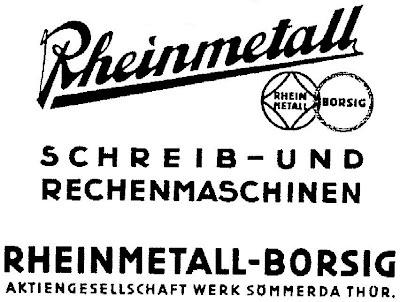 Rheinmetall AG was founded as Rheinische Metallwaaren und Maschinenfabrik Actiengesellschaft in Dusseldorf on April 13, 1889. It was set up by Heinrich Ehrhardt, from the Hörder mining and metallurgical organisation, who had been offered a commission to fulfil a large ammunition order from the German War Department, and who got the financial backing of a cconsortium of banks from Berlin, Frankfurt and Dusseldorf to take it on. Production began in December that year. In 1901 Ehrhardt took over bankrupt ammunition and weapons factory AG Sömmerda and at the outbreak of World War I, Rheinmetall was one of the largest arms manufacturers in the German Empire. By the end of the war, the workforce had increased to nearly 48,000. But then German arms production was halted. 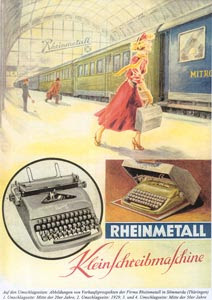 The provisions of the Treaty of Versailles forced Rheinmetall to switch to locomotives, railroad cars, agricultural machinery and steam ploughs. At the factory in Sömmerda, precision mechanical equipment such as typewriters and calculating machines were produced. 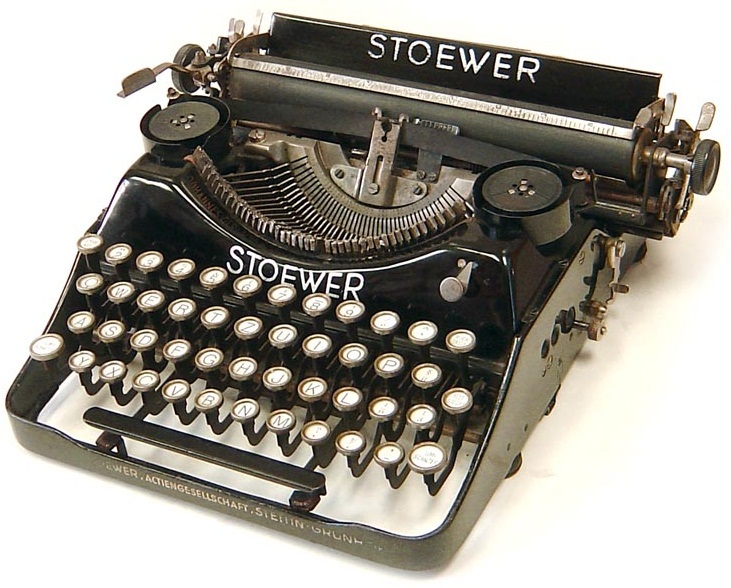 In 1931, Rheinmetall developed its first portable typewriter from a design by Leopold Ferdinand Pascher for Stoewer. From 1921, the provisions of the Allies allowed Rheinmetall to resume production of weapons systems in small numbers. The German Empire acquired a capital increase in the company in 1925. In April 1933, Rheinmetall acquired locomotive manufacturer Borsig and thus came into possession of a large plant in Berlin-Tegel. Production switched to machine guns, cannons, anti-tank guns, mortars, field guns, anti-aircraft guns and rail guns. Armoured tracked vehicles were also developed. 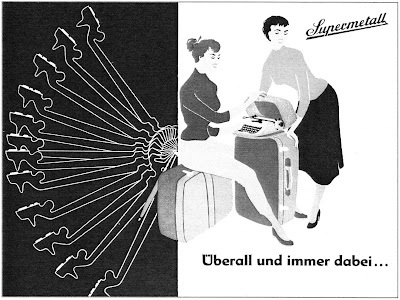 In 1938 the company moved its headquarters from Dusseldorf to Berlin. It was nationalised and fully integrated into the preparations for war. War severely damaged Rheinmetall's plants. In the reconstruction period, Rheinmetall's factories in Dusseldorf, West Berlin and Unterluess came under the control of the Western Allies and trusteeship, while those in East Germany fell under Soviet control. Rheinmetall AG in Dusseldorf built typewriters, bumpers, lifts, tannery machinery and transportation and loading facilities. The brilliant KsT line of portable typewriters was introduced in 1945. The Supermetall came out in 1959. 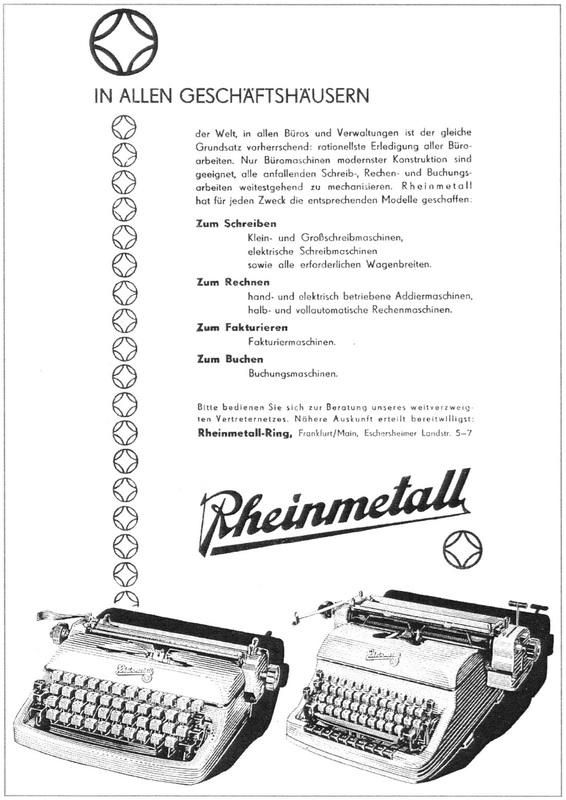 The Rheinmetall factory in Sömmerda was on June 3, 1952, returned to the East German government. From 1958 it was run by the state-owned enterprise VEB, which eventually became Robotron. Nowadays Rheinmetall generates annual sales worth more than four billion euros and is Europe's 10th largest arms company. KSPG is the holding company of Rheinmetall's automotive division and is a global supplier of air supply and emission control systems, coolant and oil, circulating and vacuum pumps, pistons, engine blocks and engine bearings. 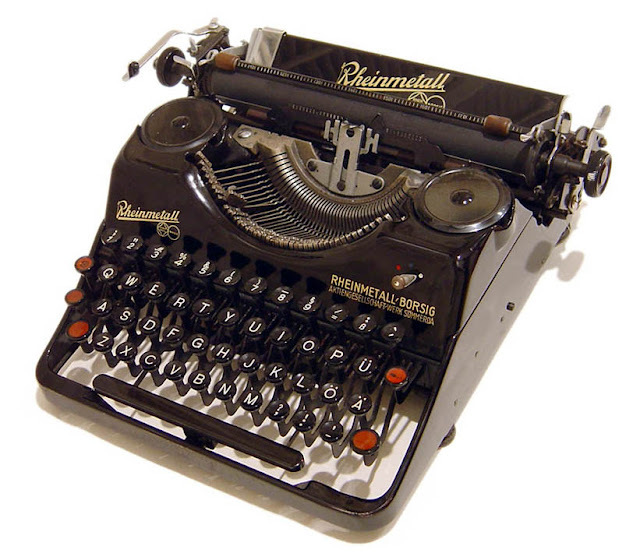 A Rheinmetall is a typewriter that I yearn to have. It's interesting that the woman you spoke to was so willing to believe that her Commodore was more impressive and more valuable than it really was. 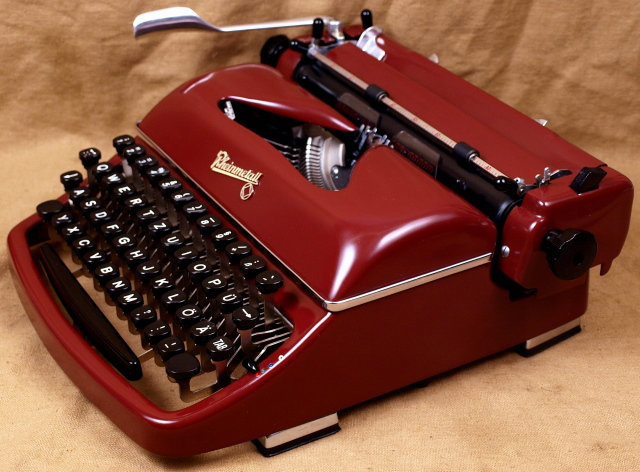 This is the dark side of making typewriters more popular; greed will out. 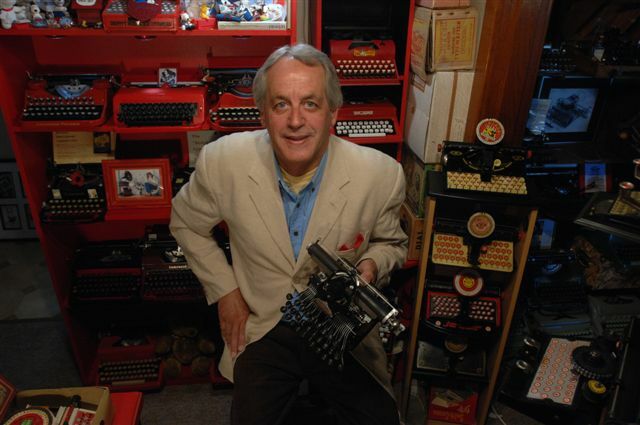 I would have been impressed to know that Jack Tramiel had something to do with typewriters if I didn't know that his company was a "Jack of all trades" before it bought MOS Technologies and was able to produce personal computers. Then again, it was with a Tramiel company product (a Commodore 16) that I started the path to my professional career, so I have mixed feelings about this chap. These are stunning machines. I too would love to have a Rheinmetall.. Or/and a Commodore. Just a quick note: I once met Jack Tramiel in (I think) 1989 at a Commodore trade show in Sydney. The guy could have potentially changed the world of computing at the time, and it is a shame to see his beloved company has more or less mirrored the fate of the typewriters that started it. 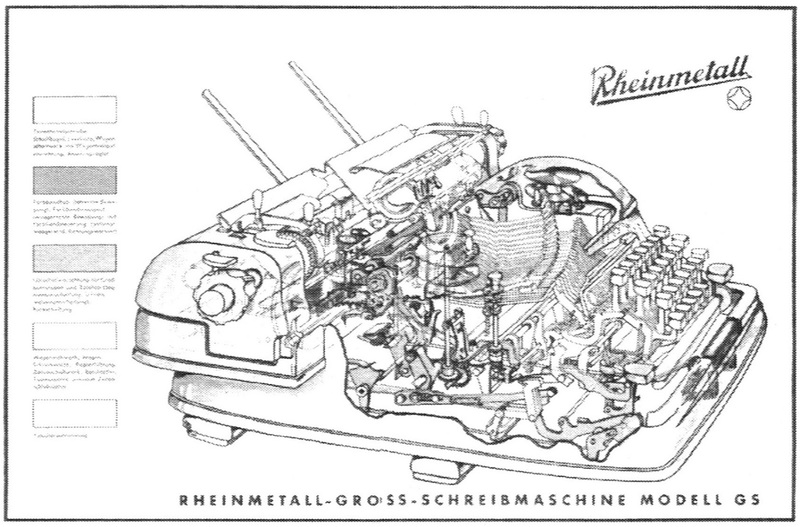 I have a Kleinschreibmaschine Rheinmetall Borsig with serial number 234909. Can anyone tell me when it was made ? I bought it almost new ca. 10 years ago here in Germany. Thank you. 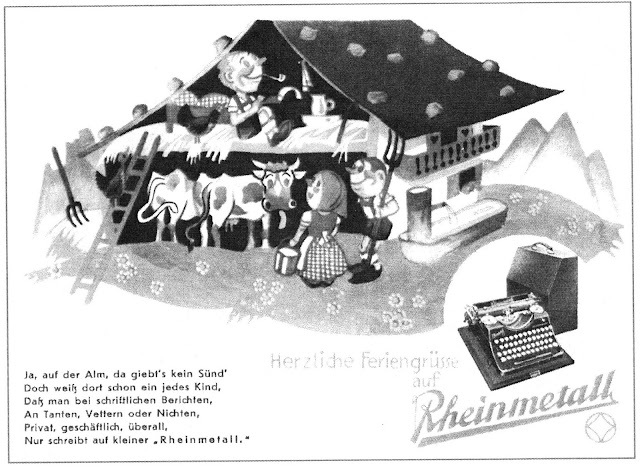 If you were able to use a Rheinmetall typewriter for daily, extended use, which year/model would you prefer? I have just brought a Rheinmetall portable typewriter and I am trying to date it? The serial number 181989. Hope you can help? Hi. 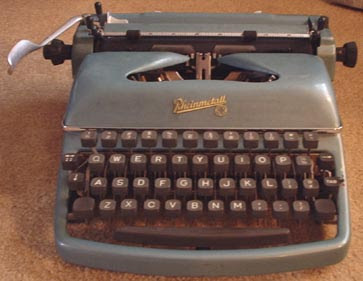 I purchased a beautiful Rhinemetall typewriter today. Can you please tell where I would find its serial number? I have a Rheinmetall Supermetall like your picture above here. I means a lot for my since it was my father that own it and I still remember the sound of it from my childhood. I am very sorry that I have lost the 'D' key, do you know if it possible to get spare parts?